While an undergraduate at Barnard College, Dorothy Papadakos ‘subbed’ one Friday night in October 1980 for Night Watch, the renowned youth program at the Cathedral of St. John the Divine in NYC, the world’s largest gothic cathedral. That auspicious night launched what would become a remarkable collaboration between institution and artist. Cathedral Organist Paul Halley was Dorothy’s improvisation mentor and appointed her Cathedral Organ Scholar in 1986. After graduating with her Masters Degree in Organ Performance from The Juilliard School in NYC, she became Assistant Organist in 1987. When Paul left to pursue other career opportunities, Cathedral Dean James Parks Morton appointed her as Cathedral Organist in 1990. She is the first woman ever appointed to this post. As Cathedral Organist, Dorothy founded The Great Organ Restoration Fund which raised money to restore the Cathedral’s historic Aeolian-Skinner Great Organ. She also founded The Vespers Organ Improvisation Series which featured the world’s finest organ improvisers every Sunday evening. Many of her live improvisations from this series are on her CD’s. (Recordings) During her 13 years as Cathedral Organist Dorothy became renowned internationally for her daring & imaginative flair for weaving secular music into sacred through her improvisations. Dorothy studied with some of the most brilliant organists of our time: improvisation mentors Paul Halley & Dr. Gerre Hancock; organ repertoire teachers James D. Poulton, Robert K. Kennedy, Maestro Dennis Keene (Voices of Ascension, NYC) and Dr. Jon Gillock, her teacher at The Juilliard School. Since leaving the Cathedral in 2003 Dorothy’s organ work has expanded into silent film accompaniments, organ composition commissions, eclectic recitals of ‘non-traditional music’ on organ and her popular improvisation master classes. 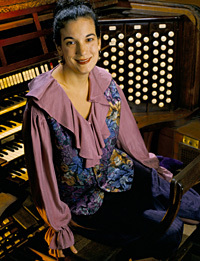 Since 1999 she has been the organist for The American Academy of Arts and Letters' annual spring Ceremonial in NYC. Ever exploring ways to broaden the life and language of the organ, Dorothy is in high demand as a unique performer, continually breaking new ground, keeping the organ fresh and relevant in today’s modern world.